This customer manufactures slides and guides for drawers in a wide variety of applications, including industrial storage, offices, medical equipment, and residential kitchens and bathrooms. Many of these applications require mechanisms that keep the drawer closed when pushed in, or provide a natural push on the drawer if someone begins to pull. While this can be achieved mechanically on a small scale, industrial storage bins may contain hundreds of pounds worth of material. American Control Electronics developed a solution that ran a small 24 VDC motor to open and close the drawer in conjunction with two limit switches, one to signal when the drawer was fully opened and another when the drawer was fully closed. When someone tried to open a drawer, it moved the drawer off the “Closed Position” limit switch. When the drive recognized this limit switch had changed state, it knew someone was trying to open the drawer and it would engage the motor to run in the open direction until an “Open Position” limit switch was activated. 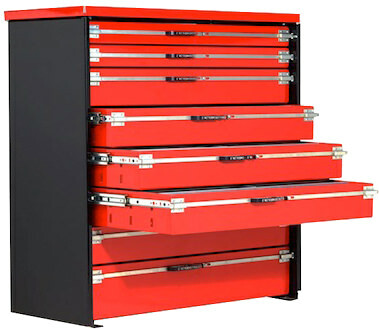 Likewise, if a drawer was fully open and someone began to close it, the drive would see the “Open Position” limit switch change state and would engage the motor to run in the close direction until the “Closed Position” limit switch activated. In addition to the custom firmware, the drive was an adaptation of the DCH401-1.5. This meant the customer could run a small, low-cost 24 VDC brushed motor directly off a 115 single phase source. The 24 VDC output is considered safer than a 90 VDC motor since the motor is mounted inside the cabinet, but prevented the manufacturer from needing to install a battery or low voltage power supply.